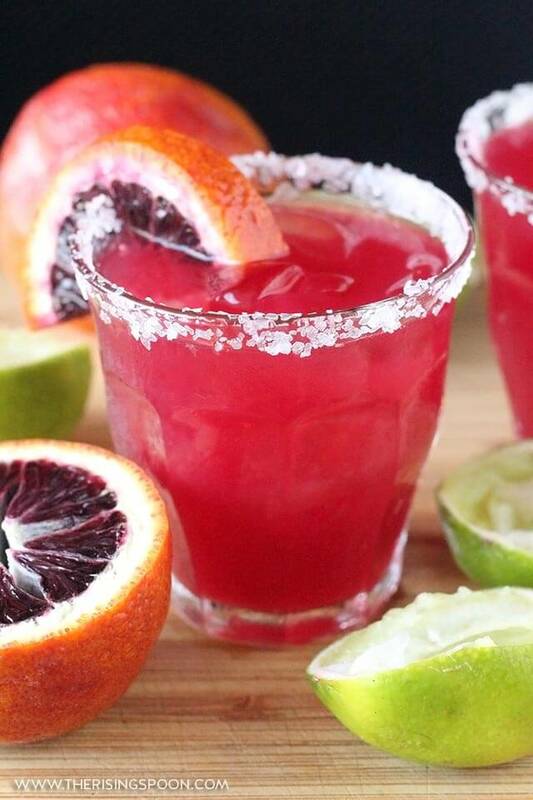 Learn how to make blood orange margaritas at home with fresh blood oranges (or bottled juice), limes, raw honey, and 100% agave silver tequila. This drink recipe looks beautiful (the color is gorgeous), goes down easy, and uses simple ingredients that are easy to find. Have you ever tried blood oranges? There are so many fancy citrus varieties that it's often overwhelming picking & choosing what to try. However, blood oranges should be at the top of your list because of their uniquely crimson color, which means its full of antioxidants in addition to vitamin C.
This seasonal citrus fruit is available late winter through spring (typically January through May here in Texas). The flesh & juice have a vivid pink/red hue (hence the blood comparison) and tastes slightly sweet with a bit of tartness. I'd describe it as somewhere between a navel orange and a Rubyred grapefruit. Depending on the variety (I've read there are at least three main ones) they may be sweeter or even slightly bitter. It's one of my favorite seasonal fruits (followed closely by peaches) so I try to use it often during the winter months, especially when it's on sale. The gorgeous color makes any recipe you use it in pop and since most of us eat with our eyes, it's an easy way to jazz up any recipe that uses citrus. Think salad dressings, quick bread or muffins, marmalade, roasted chicken or veggies, flavored salt, infused alcohol, and more! And if you have any foodie friends in your life, they'll love you a million times over if you serve them some blood orange goodies. Delicious + beautiful + seasonal = easy win! Of course, as warmer weather creeps in and Cinco de Mayo approaches, refreshing cocktails like margaritas, white wine sangria, and wine spritzers come to mind. First things first, just say NO to margarita mixes. Pretty please. Ever had a house margarita made with one of those bottled mixes and experienced an upset stomach afterward? Want to know why? Well, the main ingredient is typically high fructose corn syrup (HFCS), followed by a crappy tequila (that also contains high fructose corn syrup instead of real agave), and some synthetic citrus flavors. Luckily, homemade margaritas are super easy to make and fixing them at home lets you adjust the sweetness or tartness to your liking. My recipe below only serves 1-2, but it's really easy to multiply the recipe so you can serve it at a gathering. 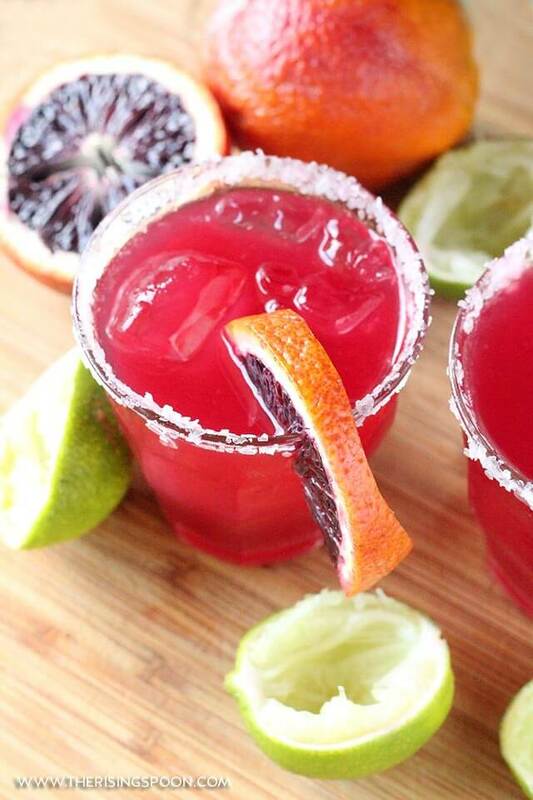 Keep in mind that like my fall & winter white wine sangria recipe, blood orange margaritas go down easy so you may want to make extra for a party. So...let's say you want to make enough to serve 10 people (or 5 people with 2 medium-sized helpings). You'll want to juice the citrus fruits earlier in the day (or even the night before if you want) and let them chill in the fridge. This will make assembling the cocktails much faster. To save even more time, mix the fresh citrus juices, sweetener, tequila & orange liqueur together while they're room temperature (it helps the sweetener dissolve quicker) and keep that in the fridge (covered tightly) until you're ready to use. When you're ready all you'd have to do it add salt to the rims of your glasses, fill them with ice, pour in the pre-made margarita mix, and top with sparkling water. NOTE: It's hard to give a specific number of oranges needed for a big batch of blood orange margaritas. Why? How much juice you get from one orange is dependant on the size of the fruit and how juicy it is. There are times I've bought blood oranges and they haven't yielded a lot of juice & other times it was the exact opposite. To be safe, I'd get at least 12 blood oranges to start out with (you can always use them in extra recipes if necessary) and juice them earlier in the day or the day before so you can grab more if need be. Or, like I mentioned above, you can mix blood oranges half & half with regular navel oranges. You'd still get a wonderful pink-ish hue & it'd save you a bit of money. Can You Use Bottled Citrus Juices in a Pinch? Of course! Fresh juice will always taste better but I get that sometimes it's not the best/cheapest/fastest option when you have a last-minute craving for a homemade margarita. Just make sure you're choosing something that's 100% juice with no weird additives or fillers added (it probably has citric acid but that's okay). Check the ingredients list to be sure. Want to Make This Margaritas Recipe? 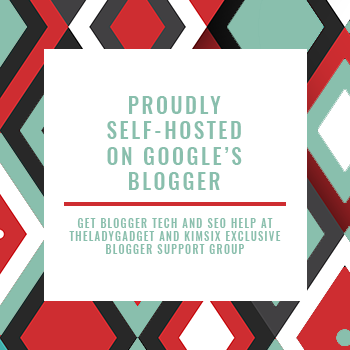 Watch The Short Video Below To Show You How! Pour a circle of coarse salt into a small plate. 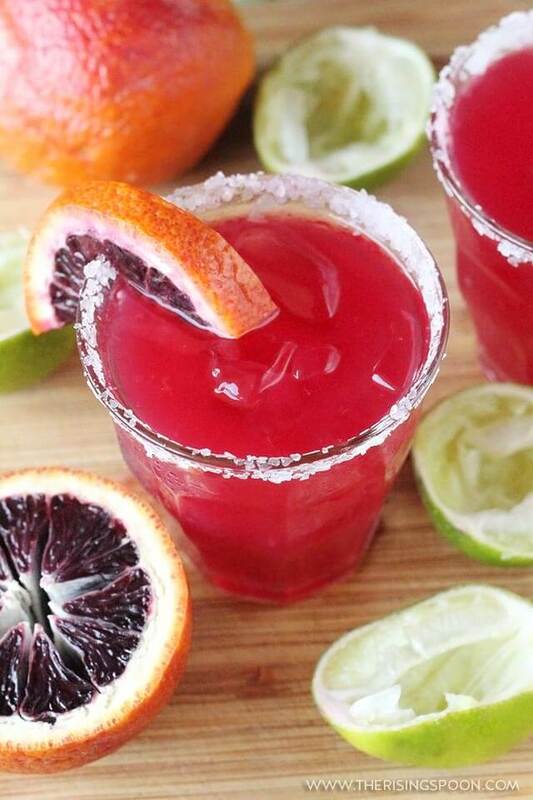 Rub a lime or blood orange wedge around the rim of your glass (or dip the rim into a small bowl of citrus juice) and press the glass into the salt, twisting it around slightly until there's a small coating of salt around the rim. Fill your glass with ice and set aside. 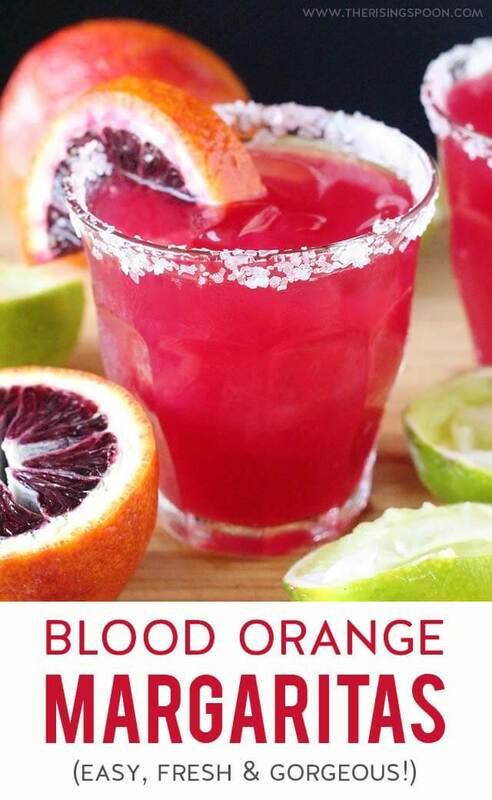 In a separate container, mix the blood orange juice, lime juice, tequila, and orange liqueur (if using). Measure in the raw honey (do not heat it) and stir until combined. It may take 30-60 seconds to dissolve, possibly longer if the citrus juices and tequila are chilled. Pour the margarita mixture into the salt-rimmed glass and (optional) top with a splash or two of sparkling water. If you want your drink extra cold, shake the mixture a handful of times over ice before pouring into the glass. Serve immediately before the ice melts. If you're using fresh fruit, make sure to roll the oranges and limes out on the counter with the palm of your hand to redistribute the juices before cutting them open. 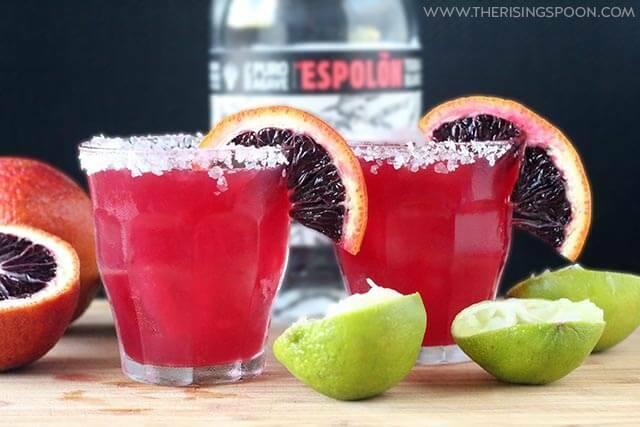 This recipe is very adaptable, so feel free to change the ratios of blood orange juice, lime juice, honey, and tequila to suit your personal taste. If you a more tart flavor, add more lime. Want it sweeter? Try extra blood orange juice or honey. For tips on making a big batch to serve a crowd, see the notes in the post above. 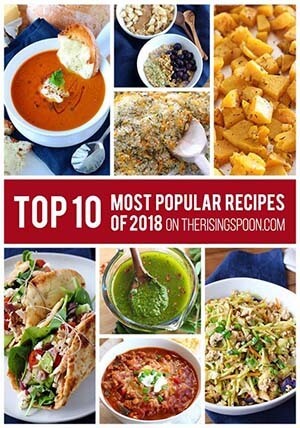 Click Here To Save This To Your Cocktail Recipes Board on Pinterest!